For the truffle filling, in a saucepan, bring 2/3 cup cream to a simmer. Place the 6 ounces chocolate chips in a bowl and pour the hot cream over the chocolate. Let stand for 1 minute, then gently whisk until smooth. Spread truffle filling over the bottom of the prepared piecrust. Freeze for 20 minutes. Meanwhile, for the shipped chocolate filling, in a double boiler or a microwave set on low power, heat the 6 ounces chocolate chip with 1/2 cup of the cream until the chocolate is just melted, stirring often. Let cool to room temperature. In a chilled bowl, beat the remaining 1 cup cream until thick. Add the chocolate mixture and the vanilla and beat until soft peaks form. 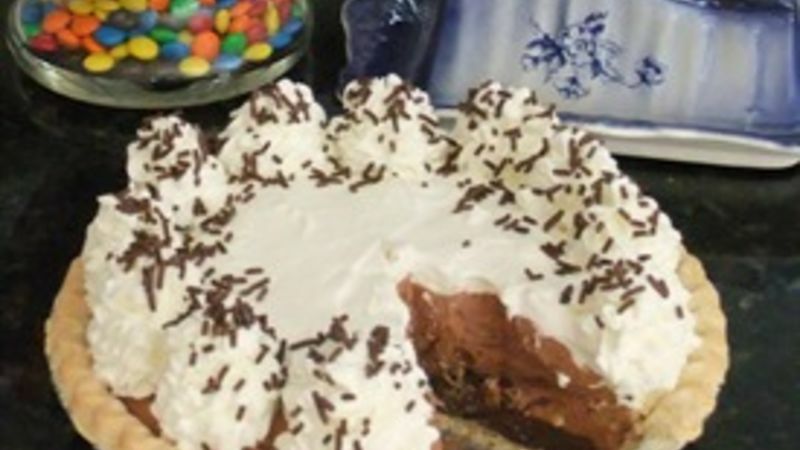 Spread the whipped chocolate mixture over the truffle filling in the crust. Refrigerate overnight. Tip before serving, for the topping, beat 1 cup cream on medium speed of an electric mixer until it begins to thicken. Add confectioners' sugar and whip until stiff peaks form. Spread the whipped cream over the top of the pie. Serve immediately.